Permaculture puts care for people and community on equal footing with care for the environment. Human beings are PART of the system, not apart from it. We have a vital role to play in caring for the earth and by doing so we are also caring for each other. How Does This Ethic Apply in My Yard? Our yard provides benefits to the people in our house and the people in our community. We grow food. When I plan what food I want to grow I plan for health needs, to please people, and to share. I add cherry tomatoes for my husband. I add ground cherries for my nieces and neighborhood children. I grow greens for my health. The act of working with the earth by gardening an act of caring for the earth and for myself. It’s a healthy outdoor activity. It’s a good excuse to move around and gets me out in the sunshine. Gardening leads to many great opportunities to talk with neighbors, especially seniors and stay-at-home moms out walking the babies. Everyone wants to talk when they see you in the garden. It builds community networks and an active street life makes the neighborhoods safer. The flower garden brings beauty to passersby and makes our whole neighborhood more pleasant. The garden is a learning place. Last fall a 2nd grade class visited from a nearby school. I gave the children a tour and taste. When planning how to fit everything into our small space, we made sure to include an area for rest, relaxation and enjoyment of nature. We enjoy having friends and neighbors over in the evening to socialize but we noticed that our plastic lawn chairs were flimsy and possibly unsafe. This year we built a really sturdy bench, just in time for National Night Out. We had 30 neighbors here that night! 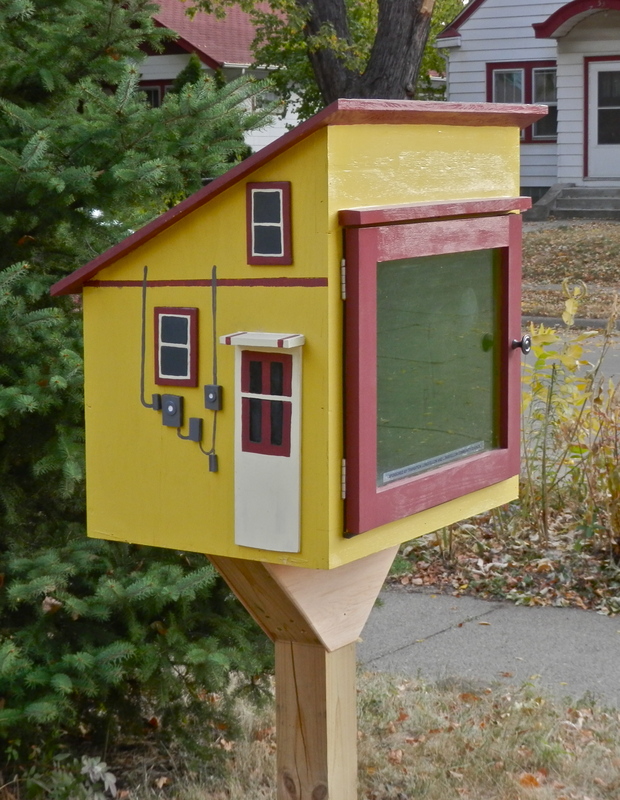 Our little free library allows us – and lots of our neighbors – to share knowledge and entertainment with others. At least a handful of people stop to browse every day. What’s Next in Caring for People? We’re eyeing the space by the little free library as an area where we can continue to share and care for our community. We want to build a bench so people can sit and look at the books. We’d like to add an information area where we can post information about the neighborhood sustainability group. I’d like to add a couple of cherry tomato plants right by the library post. I’d like to put a dog watering station there, too, but it’s so far from the house that I don’t know how I’d keep it filled with water. So that’s just an idea for the time being. This entry was posted in Food/gardening and tagged garden planning, gardening, permaculture. Bookmark the permalink.